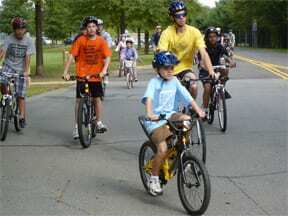 The League of American Bicyclists announced the 2010 Bicycle Friendly States rankings, based on a 95-item questionnaire that evaluates a state’s commitment to bicycling and covers six key areas: legislation, policies and programs, infrastructure, education and encouragement, evaluation and planning, and enforcement. New Jersey advanced to 8th place among the states and won Bronze Level Bicycle Friendly State designation. New Jersey was one of only three states that received a Bicycle Friendly Award, with Oregon receiving a Silver designation and Delaware, a Bronze. View the entire state-ranked list and a breakdown of how the states fared in each evaluation category. Sonya and Amelia bike to work and school. For some, Bike to Work Week meant Bike to School Week. Sonya Legg decided it was time to teach her 10-year old daughter, Amelia, how to ride on the road. Amelia’s 1.5-mile route takes her across Cranbury Road and up Millstone Road to Plainsboro. She did it three times last week (skipped the days when she had to bring her viola to school), for 9 miles roundtrip, and mom rode 24 miles to work roundtrip. Sonya notes a few things she’s teaching her daughter: Assume cars will not stop for you at yield signs; assume parked car doors will open in front of you; assume cars will pull in front of you to turn right. Sound familiar? A few more kids riding to school: Emily Tufford to Pond Road Middle School in Robbinsville (12 miles so far this month) and WWBPA student advisor Kim Meersma to WW-P High School South (3 miles). Can we add anyone else to the list? Other mileage totals for Week 3 of National Bike Month: Ben Tufford’s 120 miles, Bill Garrett’s 73 miles, Van Cotter’s 29 miles, Silvia Ascarelli’s 17 miles and Juan Cardenas’ 12 miles. That’s 258.5 miles (and many haven’t reported miles yet), bringing the total to 1,189.9 commuting and errand-running miles, plus lots more “fun” miles. Apologies for being so late with the Week 2 mileage report. But because I am so late, I can include a quick mention of Arnold Kelly, a West Windsor resident who has been bike-commuting since the 1973 energy crisis. How’s that for impressive? Back then, New Jersey Transit knew they didn’t allow bikes but there was no policy about fold-up bikes. So he got one of those, took it on the train to Linden and rode the rest of the way to work. He says he never got booted off, even when trains were packed. He definitely has earned his more civilized commute to Princeton. Arnold, join our National Bike Month mileage tally! And thanks for stopping by at the Bikers Breakfast at the station! We’ve got another 611.4 miles to add, which puts us at 931.4 miles halfway through National Bike Month. Add some “for fun” miles from three people (shall we include them?) and we’re at 1,014.5 miles. Ben Tufford rode 270 miles in nine days over the first two weeks. 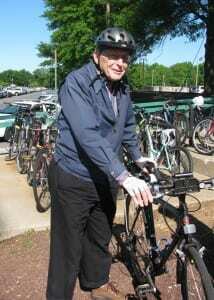 “I commute by bike through West Windsor and enjoy it. I’ve noticed new striping and signage along my commute. Thanks for all of your efforts.” We like the new bike lanes too! Bill Garrett reports seeing a fox one morning as he rode through Mercer County Park, part of his 98-mile week. Two other big bikers, Deniz and Jessica Dagci, rode 53.4 miles and 45 miles, respectively. Bruce Ellsworth got in one day of commuting for 22 miles and it was a cold day. He reports: “It was on Wednesday, and the weather was dicey. Surprisingly, it was colder on the ride home in the evening than in the morning (around 48 degrees). I had to wear my rain gear and my cold weather gloves, and I rode my hybrid to spare the road bike. A driver surprised me by NOT passing me and making a right-hand turn right in front of me. Instead, they slowed down and waited until I passed their turn. I was pleasantly surprised, and it made me smile on that cold day.” Thumbs up for that driver! WWBPA trustee Chris Scherer logged 45 miles. And then there are those of us with short rides to the train station. Juan Cardenas and Silvia Ascarelli (one who also has some “for fun” miles) each rode nine commuter miles. Send in your latest reports. Next week, I’ll tell you about a couple of 10-year olds who ride to school. Anyone else know kids who ride to school? Until then, keep pedaling and enjoy National Bike Month! National Bike to Work Week was the right time to celebrate the installation of new bicycle racks and lockers at the Princeton Junction train station. 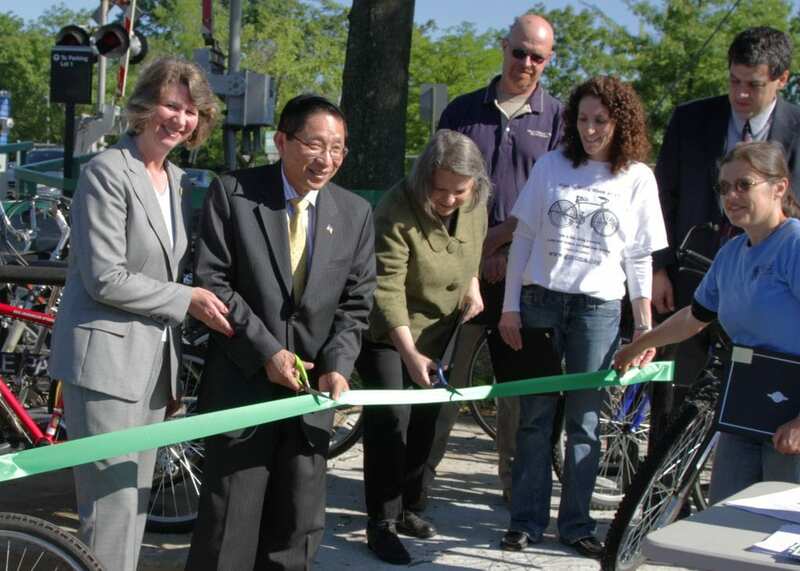 From left, West Windsor Councilwoman Linda Geevers, Mayor Shing-Fu Hsueh and West Windsor Parking Authority board member Alison Miller cut the ceremonial ribbon while Dave Brown of the West Windsor Public Works Department, Cheryl Kastrenakes from Greater Mercer Transportation Management Association, Mike Viscardi from New Jersey Transit and Silvia Ascarelli of the West Windsor Bicycle and Pedestrian Alliance look on. This project, which created more than 40 additional bike spots, could not have been done without the cooperation of many groups. It was jointly funded by the WWBPA, GMTA, West Windsor Parking Authority and West Windsor BikeFest. New Jersey Transit provided bicycle racks and lockers, and West Windsor Public Works handled the installation. 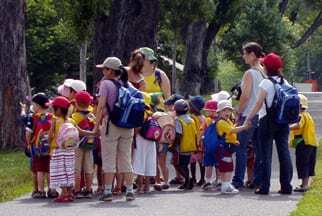 GMTMA handles the locker-rental program. The mayor and West Windsor Council applauded the project with a Special Proclamation. Thank you for that and thank you to all who made this happen. Tuesday’s weather forecast looks dicey so we are postponing the ribbon-cutting and bikers breakfast until Thursday. (What is it with the WWBPA and the weather?) Both events take place at the bike racks between the Dinky and the Trenton-bound tracks. The bikers breakfast (coffee, something to eat, a WWBPA map) will start by 6:30 a.m., and the ribbon cutting for new bike racks and lockers is set for 8:30 a.m.
A West Windsor resident emailed the WWBPA about a broken button to activate the pedestrian walk signal at the intersection of Alexander Road with Bear Brook Drive and Vaughn Drive as well as two street lights that were out at the intersection. The WWBPA forwarded his concerns to the mayor, who quickly ensured that the needed repairs were made by Mercer County and PSE&G, respectively. 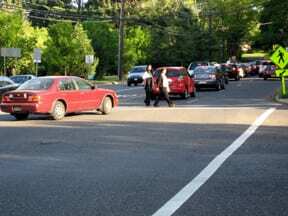 The WWBPA is advocating for a Complete Streets Policy, modeled after a policy adopted late last year by the New Jersey Department of Transportation. As part of Complete Streets, the WWBPA is also proposing an ordinance requiring bicycle and pedestrian facilities at future roundabouts. Read the WWBPA’s letter to the mayor, proposed Master Plan changes, and proposed Roundabout Ordinance, and contact our officials to express your support! 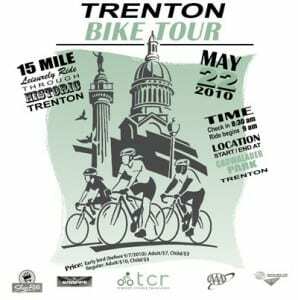 Trenton Cycling Revolution, another area advocacy group, is helping with the annual 15-mile Trenton Bike Tour on May 22. One rider calls it “the coolest way to see the city.” The police-escorted ride starts at 8:30 a.m. at Cadwalader Park. Cost is $10. And of course there is the local Ride of Silence after work on May 19. Runner-up is Deniz Dagci. Wife Jessica reports he rode 74 miles since May 1, including errands and such. “For both of us, commuting is 35 miles a week. My total since May 1 is not as impressive, just 48 miles (it was concert week, poor Deniz was left with most of the errands),” she says. 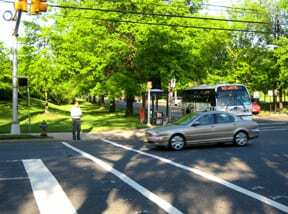 The Dagci household is car-free and the two commute to Princeton University. John Kuhn reports riding to work 2 ½ times for a total of 25 miles. 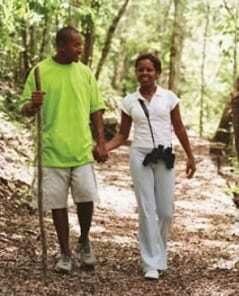 Unfortunately, he got a flat tire on the way home Wednesday and got his wife to pick him up. Van Cotter racked up seven commuting miles and an eighth for errands (plus 35 for fun). Another train commuter, Juan Cardenas, rode 12 miles over four round-trips to the station. Total so far: 320 miles. Keep pedaling! The WWBPA is partnering with the Boys & Girls Club Bike Exchange to collect used bikes at the West Windsor Farmers’ Market Saturday, June 12. Established in 2009, Bike Exchange New Jersey benefits the Boys and Girls Club of Trenton’s after-school program. According to a recent article in the Princeton Packet, Russ White said Bike Exchange New Jersey raised over $40,000 for the club in 2009, and has already raised $10,000 so far this year. Let’s do our part! If you have old bikes that can be refurbished, bring them to the West Windsor Farmers’ Market on June 12, or visit the Boys & Girls Club of Trenton and Mercer County website to find a drop-off location — there are several in the area that will take bikes any time. What do you think? Would you like to see something like this in the community? We also like this video of high school kids in the U.S. creating a “bike bus” — riding as a group to get to school — though, again, we think they should wear helmets (and maybe add some lights). High School Bike Bus from Keri Caffrey on Vimeo. Kyle Nylander, an experienced group ride leader with the a local bicycle club, will lead a Ride of Silence on Wednesday May 19 at 7 pm from Mercer County Park marina. At the same time, Heather Haggan will be offering a Ride of Silence from Van Horne Park behind Princeton Fitness, Skillman/Montgomery. Part of a growing international event, the intention of the Ride of Silence is to promote bicycle safety and driver awareness of cyclists on the road. The West Windsor ride length is 12 miles. Please arrive by 6:45 p.m. and bring water, spare tube, helmet, and wear some form of a black band on your arm such as a black ribbon, piece of clothing or wide black tape. There is no charge for this ride. 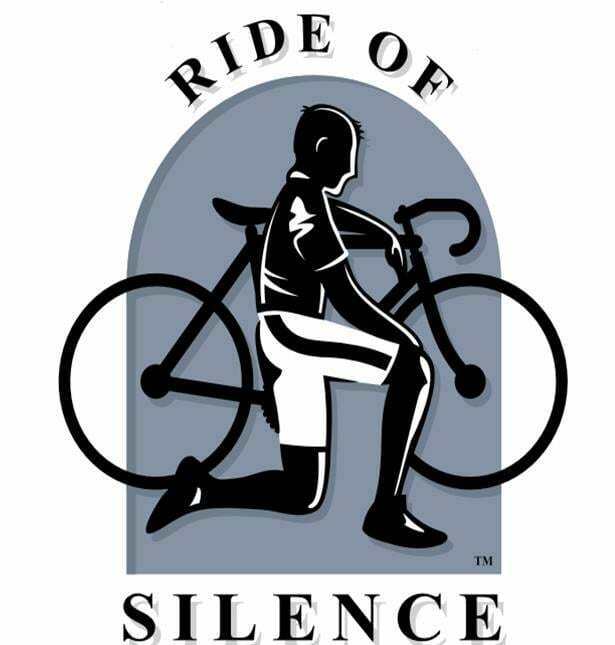 Why Does Ride of Silence Exist? Please note that while these rides aren’t sponsored by the WWBPA, we fully support their mission and objectives, and are helping to publicize them by encouraging everyone to join in. 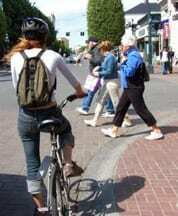 U.S. Transportation Secretary Ray LaHood would like to create bicycle and pedestrian networks throughout the country. Though 90% of Americans will still use their cars, 59% would like to add more alternatives, including mass transit, bicycle and pedestrian routes (Transportation for America 2010 survey). 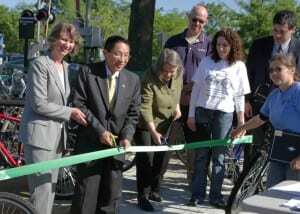 Listen to an April 25, 2010 NPR story, “A National Network of Bike Trails? 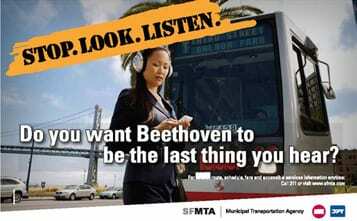 It Could Happen,” including an interview with Secretary LaHood. What a Bike Ride to Work! 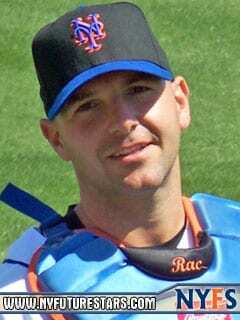 The Mets’ bullpen catcher, Dave Racaniello, dreamed of riding his bicycle cross-country. Instead, with some encouragement from Mets star David Wright, he rode his bike from Newark to spring training in Florida. That’s one way to get in shape for the season! (If CC Sabathia had joined him, maybe he wouldn’t have started the season with such a big tire around his middle.) Read more here. May is National Bike Month. How are you taking part? Also, watch a video of Bike New York’s savvy cyclist program. Interested in attending a similar class in West Windsor? Email us! Bike New York is willing to teach one.